Biogas is used for many different applications worldwide. Biogas is the gaseous product of the anaerobic digestion (decomposition without oxygen) of organic matter. It is typically made up of 50-80% methane, 20-50% carbon dioxide, and traces of gases such as hydrogen, carbon monoxide, and nitrogen. In contrast, natural gas is typically made up of more than 70% methane, with most of the rest being other hydrocarbons (such as propane and butane) and only small amounts of carbon dioxide and other contaminants. Biogas is used for many different applications worldwide. In rural communities, small-scale digesters provide biogas for single-household cooking and lighting. China alone is estimated to have 8–17 million of these systems. Large-scale digesters provide biogas for electricity production, heat and steam, chemical production, and vehicle fuel. In 2003, the United States consumed 147 trillion BTU of energy from landfill gas, about 0.6% of total U.S. natural gas consumption. 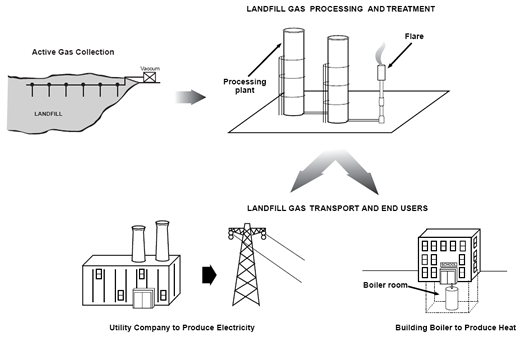 Biogas is sometimes called swamp gas, landfill gas, or digester gas. When its composition is upgraded to a higher standard of purity, it can be called renewable natural gas. Once upgraded to the required level of purity (and compressed or liquefied), biogas can be used as an alternative vehicle fuel in the same forms as conventionally derived natural gas. A 2007 report estimated that 12,000 vehicles are being fueled with upgraded biogas worldwide, with 70,000 biogas-fueled vehicles predicted by 2010. Europe has most of these vehicles. Sweden alone reports that more than half of the gas used in its 11,500 natural gas vehicles is biogas. Germany and Austria have established targets of 20% biogas in natural gas vehicle fuel. In the United States, biogas vehicle activities have been on a smaller scale. Examples include a landfill in Whittier, California, that fuels vehicles with CNG derived from the landfill. Several pipeline operators and many states are driving the focus on biogas as another source of commodity gas that can be cleaned, metered, collected and transported to consumers. The focus is to gather marginal volumes of biogas from multiple sources, such as farms, landfills, waste treatment plants and swamp bogs, relatively close to pipeline infrastructure. For information on PHMSA R&D related to biogas, please visit https://primis.phmsa.dot.gov/matrix/prjQuery.rdm. Unselect all filters; then, select the filter for “Subjects/Threats” and using the drop down box, select “Biogas” from the list. This will itemize all related projects.